Past is past........or is it? I used to get queries from my friends to send them my "Investment Advice Mails" from time to time. I suddenly stumbled upon this email sent back in November 2008 to few of my friends. Funny to see that what I was thinking back then pretty much is the reality now. Well, that was then. If you remember correctly Markets fell further in December and again in March 2009 and then turned around. 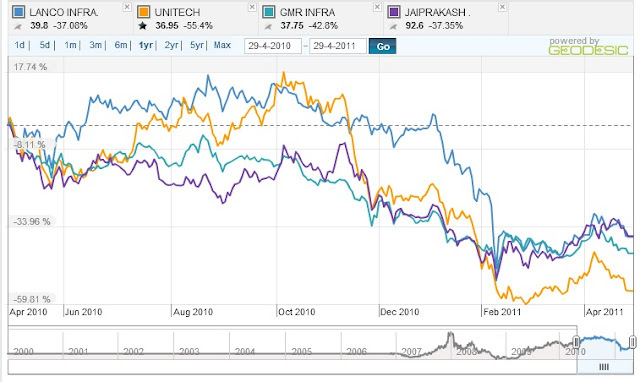 The Indian Election was the game changer as far as Market performance in 2009 was concerned. The Left was left out which made the markets smile. Most of the funds mentioned above did well too. But what I have learnt so far is that no matter what you do in the Market you will have to get the timing right every time. You need to know when to enter and when to exit. That my dear readers is the simple trick. I'm sure we'll be talking a lot about that in time to come...so long my friends, happy investing! routers, various classifications have some relevance, but not entirely consistent. Join the router to your broadband modem utilizing an Ethernet cable. Really don't neglect the issue of the compatibility on the wireless router, Linksys or not, together with the pcs inside the network. To fix this, you will first have to determine what INTERNET protocol address your printer is utilizing. Our fabric shops had some beautiful trims, but we'd a tight budget.